The Watson EN-EL18 Lithium-Ion Battery Pack works with the same cameras as the Nikon EN-EL18. This replacement battery pack features a capacity of 2600mAh and 10.8V of output power. Small and lightweight, lithium-ion batteries can be charged or discharged at any time without developing memory effect. Box Dimensions (LxWxH) 6.2 x 3.1 x 1.6"
EN-EL18 Lithium-Ion Battery Pack (10.8V, 2600mAh) is rated 4.1 out of 5 by 34. Rated 5 out of 5 by treefree from Nice battery All of the camera bodies that I have purchased from B&H have included a spare Watson battery. I am a pretty firm believer in buying origional brand batteries.... I own 5 for my D2x. Some of these origional brand batteries are 10 years old and they are still performing like new. That being said, I am please with the Watson brand battery so far. It slips into the charger perhaps better than the origional brand battery & I have high hopes. The fit & finish is as good as the origional brand. I think it will work out fine... got my fingers crossed. Rated 3 out of 5 by Christopher from Good Inexpensive Alternative This is the first off-brand battery I have ever tried and so far I am happy with it. In the first few tries out(3), it has worked flawlessly with the camera, has held a good charge and hasn't taken any longer to recharge than the Nikon batteries. It does not, however, seem to work with the recalibration on the Nikon charger. I will be curious to see how long it actually continues to work. Rated 5 out of 5 by RODRIGO D. from Aftermarket battery Works just fine. I usually don't buy non Nikon accessories but they were out of Nikon batteries at the time so I ended up buying this battery. I have used it along side with my Nikkn battery and it performed just like the Nikon. No issues at all. Rated 3 out of 5 by Michael from Work Around Longer life in my MB-D12. But only works if you insert battery with the camera on. Otherwise the battery indicator blinks and camera won't turn on. Rated 2 out of 5 by Jensen from Better than no battery at all Not impressed with the Watson EN-EL 18. Maybe a got a defective battery but it has never held a full charge. It charges to 73% and then basically dies after 100 actuations in my camera. I personally use it as a backup battery only- knowing it has little to no life in it. The battery came with a package I bought from B&H. If I had paid for this battery on its own I would be very disappointed. The saying is true..... you get what you pay for. There is a reason this battery is so much cheaper than the Nikon version. Rated 5 out of 5 by Chip from This battery delivers the juice The Watson EN-EL 18 Lithium-Ion Battery is an excellent choice to power your DSLR. The cost makes this product a very cost effective alturnative when it comes to selecting a power source. 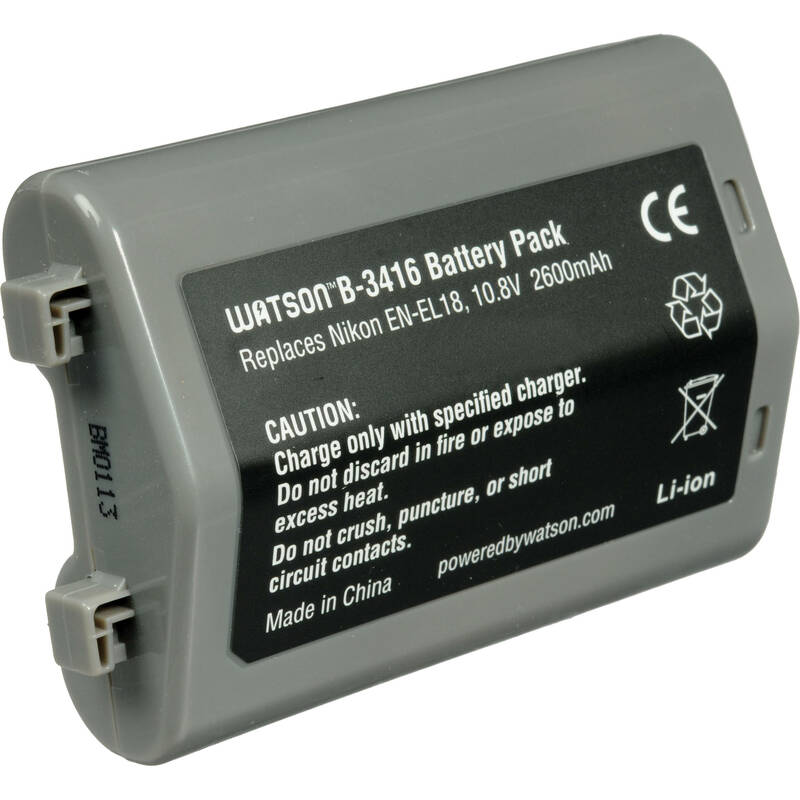 This is my 3rd Watson battery and have been very happy with the performance in my Nikon D3 and D4. I recognize no difference in the number of shots between chargings of the Watson battery than the battery recommended or provided by the manufacturer. The battery works perfect with the manufacturer's battery charger. Rated 4 out of 5 by Fritz from Works well in Nikon D4s I am using this battery in my Nikon D4s and use the original Nikon battery in the MB D12 power grip for the D810. When I tried to use the Watson battery in the power grip with the D810 the camera did not turn on. I didn't bother trying to figure out a work around. Rated 3 out of 5 by Daniel from Non-OEM (Knock-Off) Battery - Is What It Is My D4 seems a tad sluggish when powered by this copy of the EN-EL18. It discharges far faster than the Nikon version. So far, it seems to work okay; it fills a void for me, I don't feel comfortable unless I have 3 batteries for each camera I'm using for work. The Nikon OEM version lasts longer per-charge, and next time I need one of these I'll go with the OEM version. Or the EN-EL18a knock-off. Does this work with the D5? The D5 uses a EN-EL18A battery. My D4S also uses the same battery. When I bought my camera I was given a spare battery which was not made by Nikon. In one year the battery stopped working and I had to buy a replacement. So, when buying a spare battery for the D5, you should get a EN-EL18A and be sure it is a Nikon brand. They cost more but it is worth it in the long run.